The worldwide consumption of potatoes is increasing at a substantial rate with positive growth in the food-service sector. The extent of this upturn in growth was made apparent in 2018 as for the first time on record, food-service sales exceeded retail sales (source PotatoPro.com). A change in eating habits is one possible reason for this abnormality as people are eating out at restaurants more often or exploring new foods themselves with the rise in cooking shows being a major influence in this. So, potato usage has potentially increased in the food-service sector due to a change in habits favouring healthier, fresher foods. Yet for the retail industry, this may not be the case. Whilst growth is still expected, the increase in potato usage is said to be the result of a higher consumption of potato crisps/chips rather than fresh produce. Much of this growth can be referred back to the wider savoury snacks market which has seen a consistent rise in popularity year on year. Despite the wide variety of the snacks available, the traditional potato crisps/chips remain the dominant product in the market and it is these that continue to drive the popularity of potato crisps/chips to unprecedented levels. This suggests that although eating habits are changing, most people are still opting to include potato crisps/chips into their daily diet. What this also highlights are how versatile potatoes are as not only can they be produced to cater for the savoury market, they can also play the part of an integral ingredient to the healthiest, most luxurious recipes. This ultimately is good news for potato farmers and suppliers as continued growth in both retail and service sectors will only result in increased business and profits. M&P Engineering is a manufacturer and supplier of food production, preparation and filling equipment based in the Manchester, England. M&P’s equipment is used by food manufacturers worldwide having served in the industry for over 50 years. 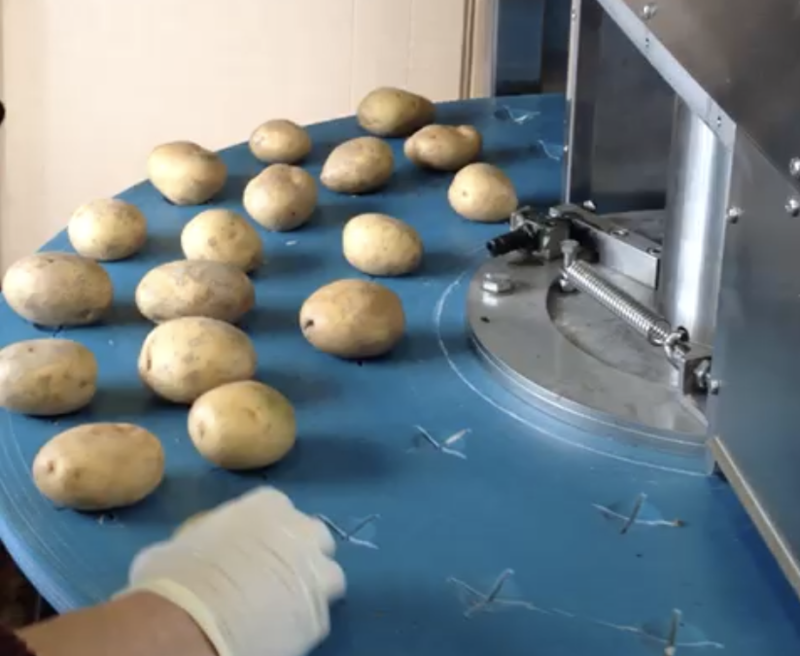 New to M&P’s product range is the Carousel Grid Cutting Machine, a highly versatile machine that can cut vegetables and fruits into fries, batons, wedges, petals and slices. With an output of 4,800 pieces for hour, M&P’s Carousel Grid Cutting Machine is one of the most productive machines of its kind available on the market. In addition to the Carousel Grid Cutting Machine, M&P also manufactures and supplies onion peelers, fillers, depositors and rotary transfer units to cater for a wide range of food manufacturing needs. To discuss any of these products with a member of the M&P Engineering team, call 0161 872 8378 or click here.